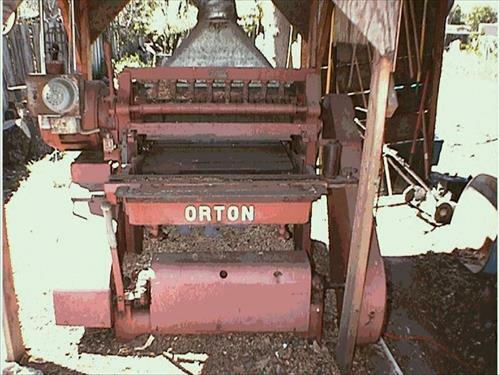 Manufactured By: Orton Machine Co. This is a working machine, made in 1945. 20 HP motor. Originally from the Universal Studios set shop. Includes a complete set of documentation I ordered from Orton. I have owned it since 1991 and have used it many times. Replaced the bed lift screws about 8 years ago and have kept it in working condition including the bed oiler. Very sharp blades now, haven't used it a lot since the last sharpening. Newish belts. I am moving to a new location where I can't keep this machine. Will consider any offer, including just selling for parts if you already own one. 3 Phase 20 HP motor. Price does not include my 30 Hp rotary phase converter. The only items missing that I can see are one of the infeed side rollers, an outfeed side roller and a blade sharpening/jointing bar, but I found it is possible to manually sharpen, or take blades out periodically for professional sharpening and resetting with magnetic blade setter works fine. For the bed lift screws, I will give you the exact thread definition, as this is a replaceable part which is not made anymore, and it's a rarely-used thread type.